opened. 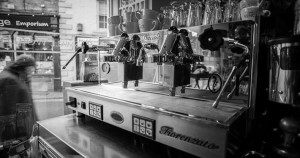 It is warm and friendly and the staff are excellent." The Small World Cafe is a family run Licensed Coffee Shop in beautiful Hexham, Open Monday through Saturday. Serving fresh homemade food every day. We source as many products as we can locally and are great advocates of “fresh is best” – milk and free range eggs are from local farms, bread from Rothbury Home Bakery and bacon and sausages from Northumbrian Sausage Company. 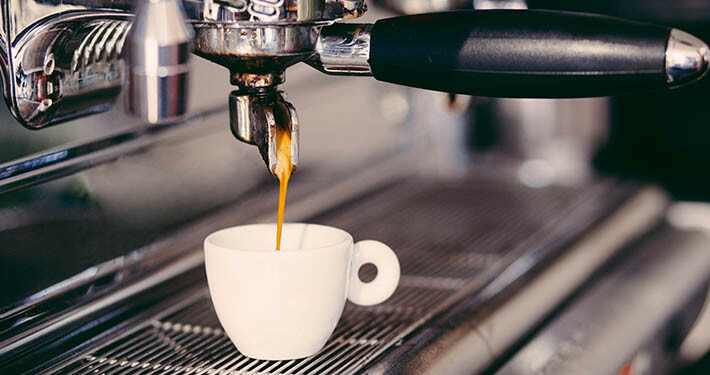 We offer the finest quality teas and coffee, a wide ranging lunch and breakfast menu, a fantastic selection homemade scones, traybakes and local and Italian cakes. We also cater for vegetarian, vegan, dairy free and gluten free requirements, with gluten free bread available for sandwiches and a wide selection of gluten free and dairy free cakes. 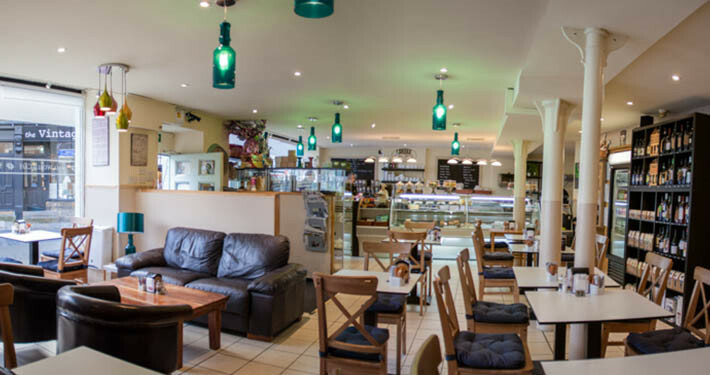 Take away service is available every day on our full menu at reduced prices – come into the cafe to check out take away prices and collect a take away menu. We also stock a range of teas, coffees, cakes, chocolates, gifts and other local and seasonal items in our deli section. Check out beers from Allendale and Wylam breweries and a full range of gins and liqueurs from Alnwick Gin. Newspapers are available everyday to add to the enjoyment of your visit. Dogs are very welcome at outside tables (April-October). Sorry, we love dogs, but no dogs (except guide dogs) allowed in the cafe itself due to the kitchen being open plan with the cafe. The ethos behind Small World Cafe is to combine our favourite local products from across Northumberland and the Scottish Borders with top quality tea and coffee – fresh, local food in a friendly, relaxed environment. Visit us for a warm welcome and great food. The Small World Cafe is the perfect venue to stop and enjoy freshly prepared food and drinks. We offer our customers high quality, fresh, tasty food. We only use the best quality ingredients, sourcing locally wherever possible – its fresher and tastes better! 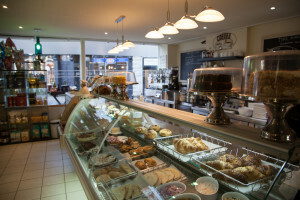 Our range includes, a wide breakfast selection, hot & cold sandwiches, chilli, salads, baked potatoes, grilled wraps and soups as well as a great choice of cakes and hot drinks. We also stock a wide range of gluten free and dairy free cakes – ask for details as you won’t be able tell the difference by sight, or taste! Perhaps our best offering is our friendly atmosphere and high level of customer service, come by and see for yourself. This cafe, which changed hands recently, has gone from strength to strength! It is always welcoming and the service from the staff is prompt, friendly and helpful. 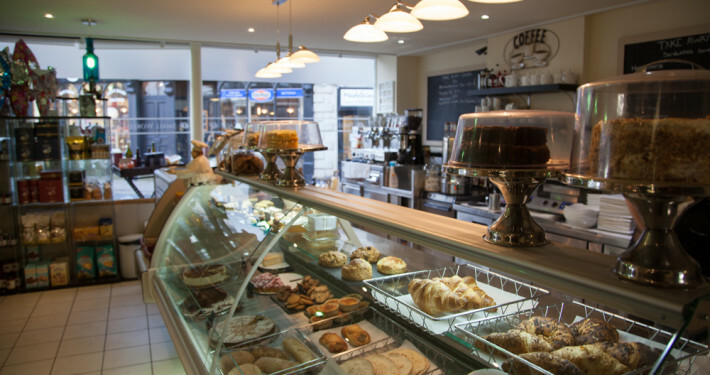 There is a range of delicious things to choose from – whether you want a simple breakfast or brunch, a more substantial lunch or a coffee and a delicious scone or cake. You can choose from cafe tables and chairs or comfortable leather couches and tub chairs in the window which look out onto the Abbey Flags and the historic market place. There are even a few tables and chairs outside for when the weather is good. Everything is freshly prepared and there is also an extensive take away menu for those who haven’t time to sit and relax. A lovely place – I wish it every success. Under new management. A gem in Hexham. Something for everyone to enjoy and healthy options available food lovely and fresh. Angela the manager very attentive and welcoming. Cafe very busy (always a good sign) but waiting times more than reasonable. Nice view and relaxed atmosphere. Will definitely return! Thank you. Just popped into one my my favourite places to eat in Hexham and was rewarded with a relaxing air of calm and the most amazing white chocolate cheese cake. I only called in for a cuppa but was immediately tempted by the cheesecake and it was fantastic! Melt in your mouth smoothness and not too sweet. Great friendly staff, looking forward to a lunch visit! Popped in with my kids for an after school treat. My eldest has Coeliac’s and so we sometimes struggle to find options for him. No problem here though. Three gluten free cakes on offer and the brownie he chose was reported to be ‘best I’ve had’. We will be back for lunch soon as they also have gluten free sandwiches and other options on the menu. Friendly, efficient service too.